In a large bowl, combine the Miracle Whip, cheese, sugar, basil and salt. 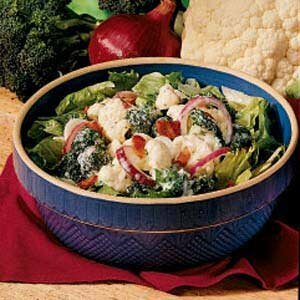 Add broccoli, cauliflower, onion, and water chestnuts; toss. Cover and refrigerate for several hours or overnight. Just before serving, place lettuce in salad bowl and top with vegetable mixture. Sprinkle with bacon. Top with croutons if desired. Makes 16-18 servings.